Server Racks Australia decreased order lead times from 4-6 weeks to around 2 weeks. Server Racks Australia (SRA) is a successful manufacturer of computer server racks and related products based in Queanbeyan in New South Wales. The business is growing due to high quality, responsiveness to customers and product innovations. Their lean improvements have been a critical element of the business’ success. This has enabled it to offer high levels of service and to compete effectively with much larger competitors. In 2009, the business has grown rapidly in both volume and complexity. Customer demand has caused SRA to offer a greater level of customisation and an increasing range of products. This growth has lead to a high level of expediting and firefighting and lead times have increased to levels that are not acceptable to the SRA team. The increased complexity has also lead to an increase in errors and rework, which impact on the profitability of the growth. The business has therefore identified the need to obtain external expert assistance to enable the business to address these issues and take the lean/TPS implementation to a more sustainable level. As well as expanding their Lean implementation into the support areas of Sales and Engineering. 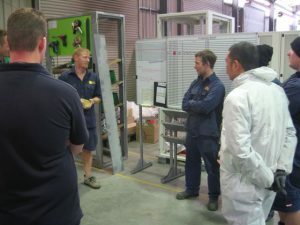 TXM consultants coached Server Racks Australia’s cross functional team through Value Stream Mapping to get the overview of where the impediment to flow are occurring.Then several smaller projects were established and a number of lean tools were implemented, including Visual Management and Daily meetings. 5S implementation, reviewing 2 bins system for consumables and an improvement in overall labelling also helped. The daily meetings were initiated in the Sales department to review daily targets and review the orders coming in. Production meetings are occurring twice a day and run through a set agenda, reviewing the production status and Tee card board, which shows which daily cleaning activities. Any quality or production issues are brought to the attention of the leadership by the shopfloor operators. This Shadow Board for Punch Tooling achieves the 5S objective of improving housekeeping and standardising the workplace, but it also reduces looking time and is an integral part of reducing set up time for this machine. The Powder coating visual controls have helped to monitor a potential bottle neck in the Production process. The daily meetings have brought amazing improvements to Server Racks, allowing any issues arising to be dealt with promptly. 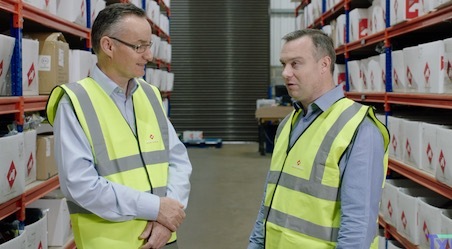 Corrections to production schedule or resources can be moved around to allow production to get back on track – this avoids nasty end of week (or worse, end of month) surprises when customer schedules are not met.